Save time and money with our unbeatable Heel Seats subscription program program! Every three months, we’ll send you a fresh new pair of Heel Seats — at an incredible discount! Just $18 per pair — the best price you’ll find on Heel Seats, no coupon required! At just $18 per pair, auto-shipping is the best price you’ll find on patented, clinically proven Heel Seats! No need to wait for a coupon code or sale. Just sign up for our Heel Seats subscription, and enjoy a fresh pair of our “little blue miracles” every 3 months. Unlike flimsy grocery-store inserts, our washable, durable Heel Seats are designed to stand up to 3 months of continuous wear. Fascia-Bar Technology realigns the bones and ligaments of your foot to an optimal position, encouraging your heel’s own cushioning fat pad to regenerate, and allowing your damaged arch to heal, all while cushioning and supporting your heel for fast pain relief. Need to pause your subscription for any reason? No problem. No fine print, no long-term commitment, no hassle! With auto-shipping you can set it, forget it, and rest assured knowing that a fresh new pair of Heel Seats will arrive on your doorstep once a quarter, to keep the spring in your step all year long. Guaranteed Pain Relief — Or Your Money Back! We’re proud to be unique, from our 5-star customer service to our one-of-a-kind orthotic inserts that have been proven twice as effective as a leading comparable orthotic insert in a double-blind study conducted by the University of Iowa. That’s why all our products come with a 100% money-back guarantee. If you’re unsatisfied for any reason, just send your Heel Seats back for a full refund. What Makes Heel Seats So Special? Multi-directional support with 360 degree motion control–no slipping or sliding! Wearing Heel Seats regularly is one of the easiest ways to keep your feet on the road to recovery. Art Smuckler, C. Ped, OST spent 30 years developing Fascia-Bar Technology to give his own patients affordable, non-invasive, effective relief from heel pain caused by Plantar Fasciitis and heel spurs. 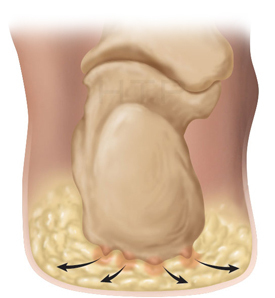 When the heel bone (calcaneus) is damaged, overused, or inflamed, it can be quite painful. 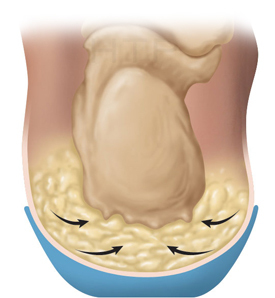 Heel Seats realign the bones and ligaments in your foot and provide a supportive, soothing cushion while your natural fat pad regenerates and your arch heals. There is a right place to stand, pain-free, with Heel Seats! Get Them Now.